The Tirumandiram (Thirumandiram or Tirumantiram), by Siddha Tirumular is a sacred, monumental work of philosophical and spiritual wisdom rendered in verse form. Encyclopedic in its vast scope, and written nearly 2,000 years ago., it is one of India’s greatest texts, a spiritual treasure-trove, a Sastra containing astonishing insight. 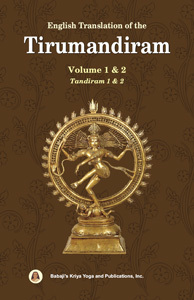 It is a seminal work and is the first treatise in Tamil that deals with different aspects of Yoga, Tantra and Saiva Siddhantha.